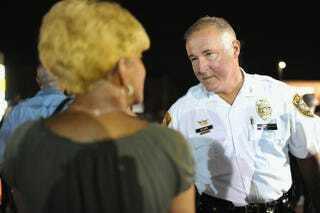 St. Louis County Police Chief Jon Belmar speaks to demonstrators during a peaceful protest on West Florissant Avenue in Ferguson, Mo., on Aug. 23, 2014, two weeks after the fatal shooting of Michael Brown. Police investigators are on the lookout for two men after a Ferguson, Mo., officer was shot while responding to a burglary report at a town community center, police said, according to the Los Angeles Times. The officer, whose name has not been released, reportedly confronted two males leaving the Ferguson Community Center about 9 p.m. Saturday, St. Louis County Police Chief Jon Belmar said, reports the Times. The officer chased the men and as he approached them, shots were fired at the officer, who raised his arm and was hit in the left arm, suffering a non-life-threatening wound, the newspaper writes. Ferguson Police Chief Tom Jackson told the media the officer was responding to a burglary. The shooting followed another tense week in Ferguson, which has been dogged by turmoil since Michael Brown, a black, unarmed 18-year-old, was fatally shot by white Ferguson Police Officer Darren Wilson on Aug. 9. Belmar also said the officer’s shooting was not related to protests over the Brown case, the report says.